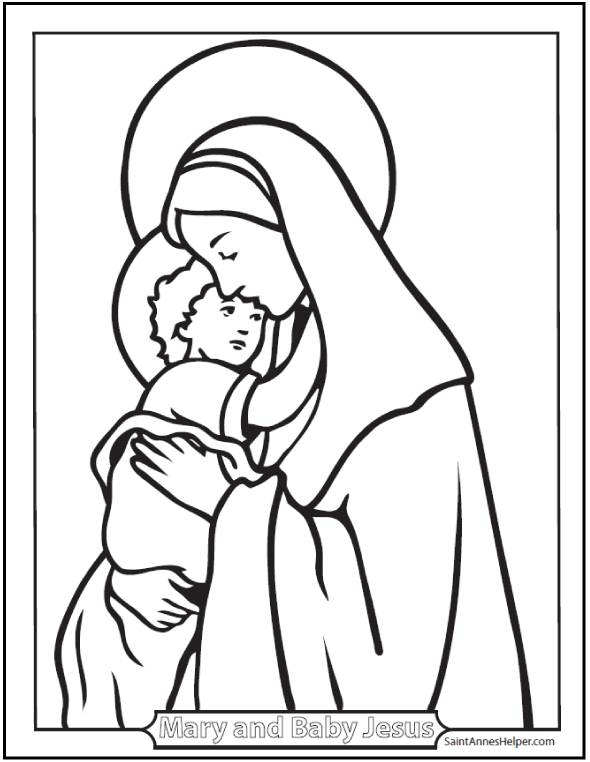 Over fifteen printable Christmas Coloring pages for catechism or a party! 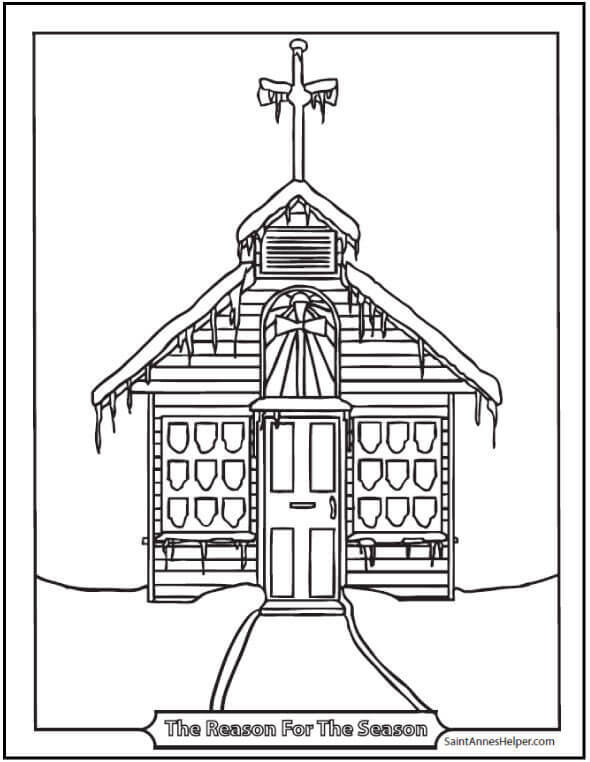 You'll love keeping Advent and the Christmas season with printable Christmas coloring pages that celebrate the real reason for the season of Christmas: Jesus' Birthday! 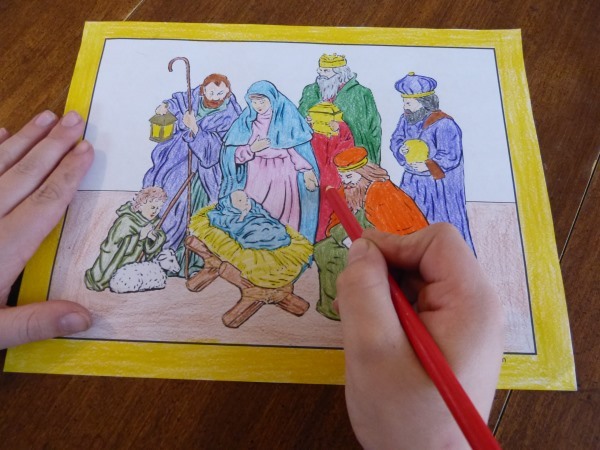 Kids love to color pictures about the real Jesus, Mary, and Joseph in the stable. 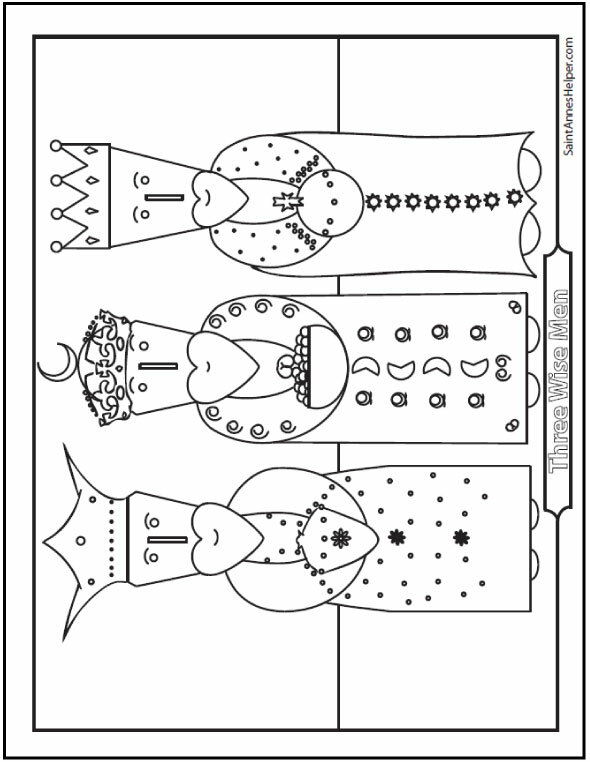 You'll find many coloring pages to print below for preschool, kindergarten, and adults. 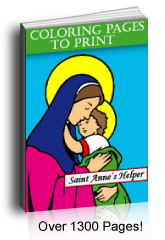 It is also easy to print the individual images as Christmas cards if you select the booklet setting on your printer. Your family and friends will love these handmade Christmas treasures from your little ones. Thank you for sharing when you can! 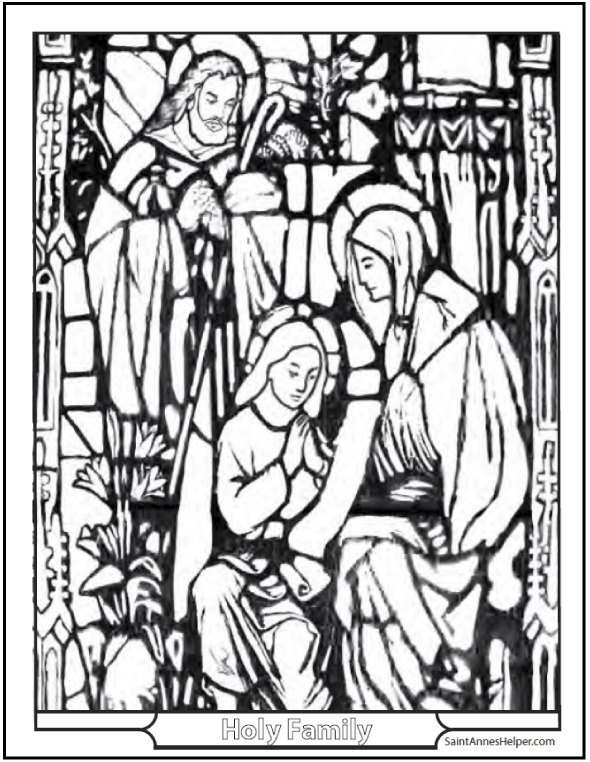 Children love seeing Jesus, Mary and Joseph in the Nativity scene. 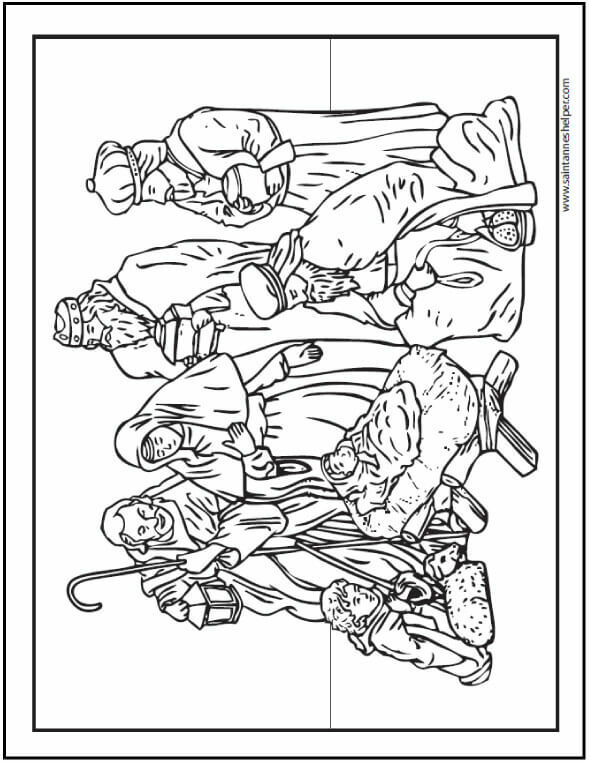 You can choose one complete with the Three Kings and the shepherd with his lambs or a simple picture for preschool and kindergarten. 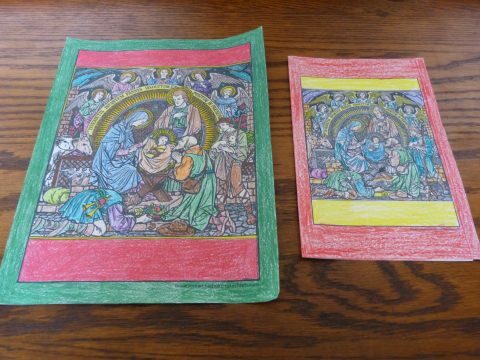 Colored pencils make the stained glass Nativity special. 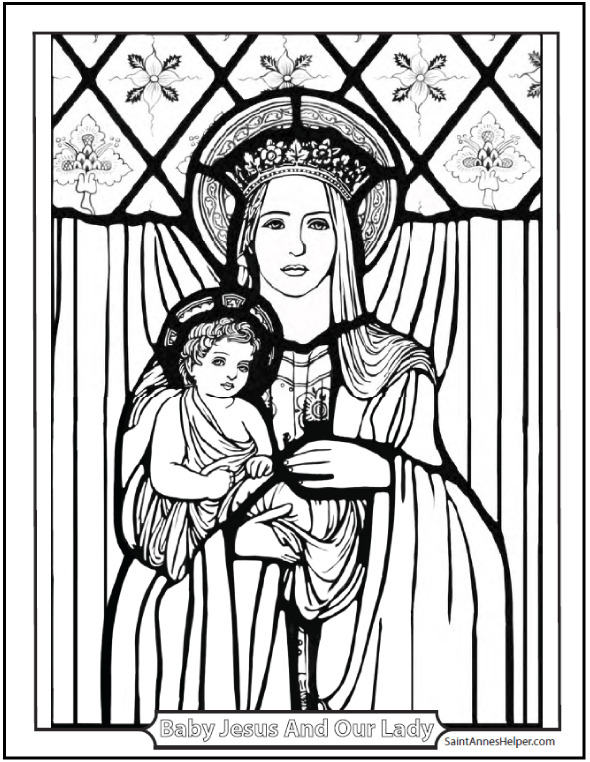 The Madonna and Child coloring page is the basis for our coloring book download where you can buy all our coloring pages in one bundle. 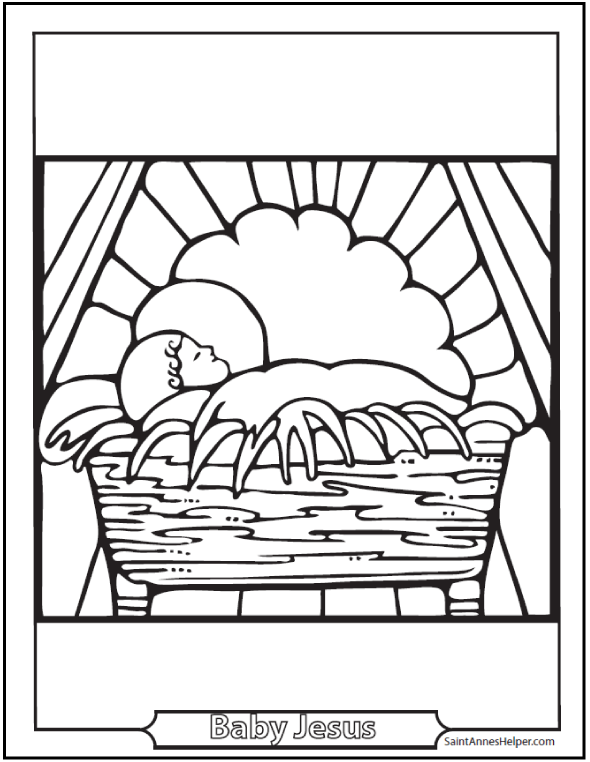 See more Christmas Nativity coloring pages here. The Infant Jesus is the star of this show. Children always like babies and this is part of His charm. 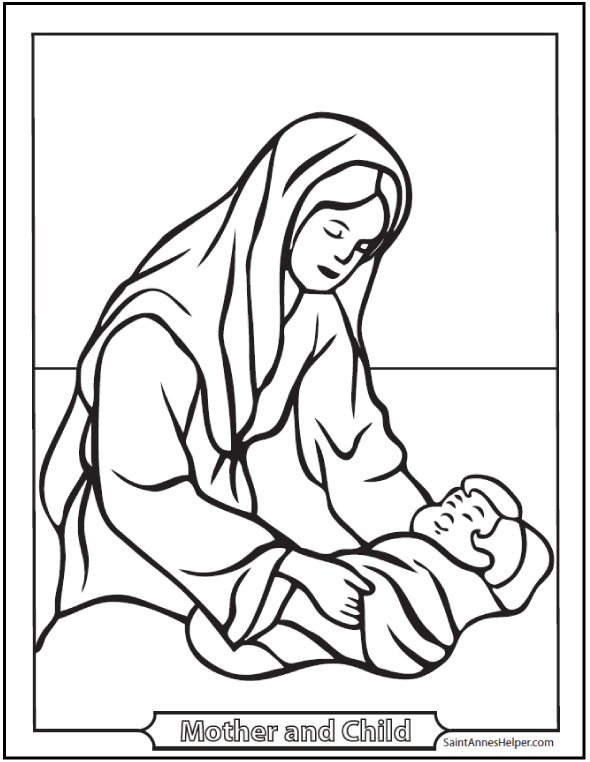 These pictures show the Child Jesus and in one He is with His Mother. 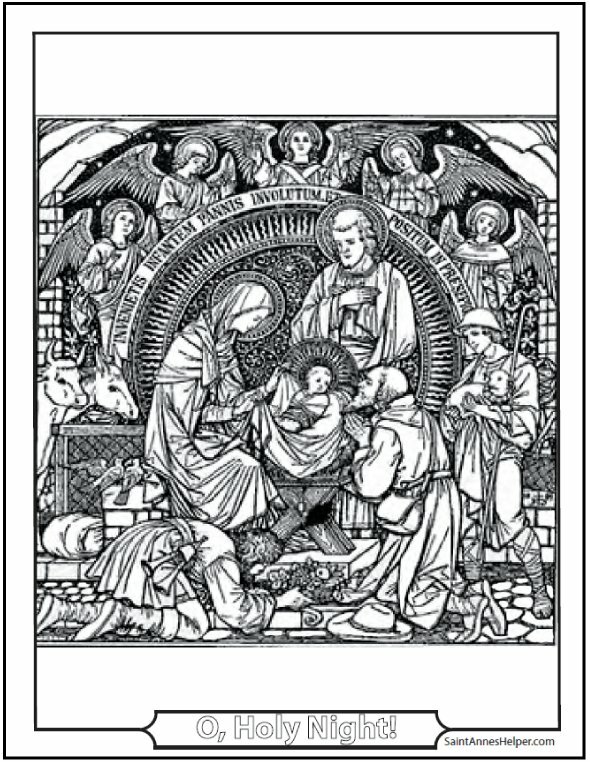 The feast of the Epiphany is January 6 and celebrates the Three Kings searching for and finding the Holy Family. 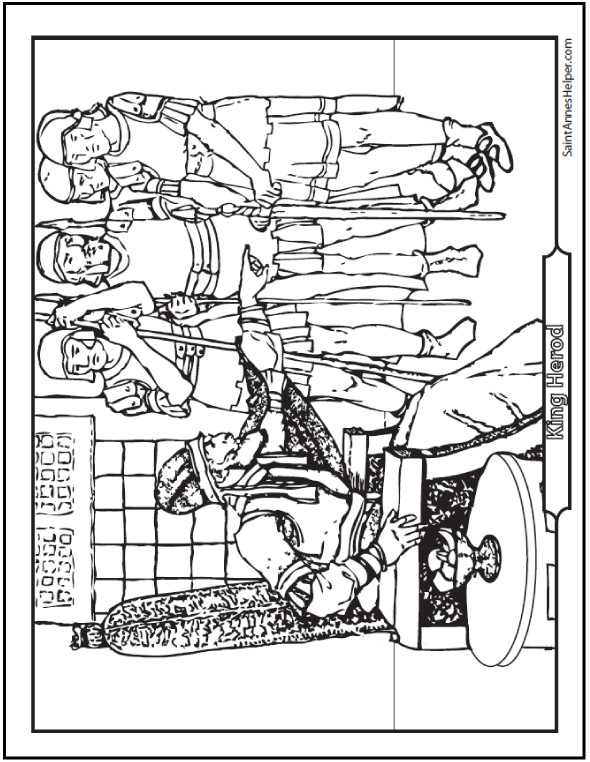 The first one shows a neat picture of the Wise Men and the next shows bad King Herod commanding the soldiers to find the Babe. After Jesus was born Joseph and Mary had to flee to Egypt. 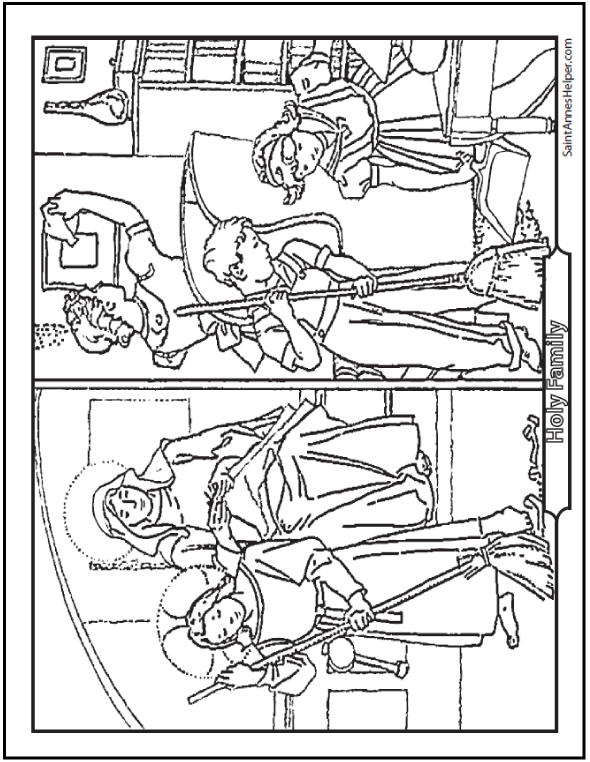 The first two pictures are based on a catechism that shows them happy in Egypt and how our lives can be just like theirs. 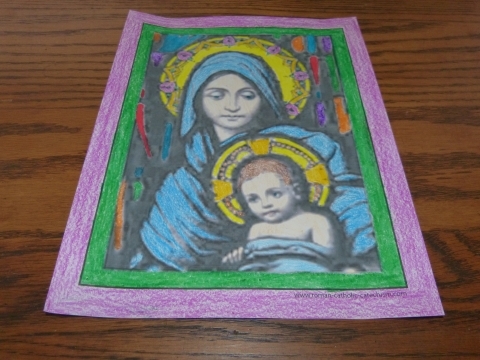 Color the stained glass picture with colored pencils for a more glass like look. Since Christmas is a holy day of obligation, God wants us go to Church. It's fun to go when everything is made pretty with snow. Remind the children to leave the roof line and ground white or some super pale color. This might be easier to do if they color the sky and walkway first. 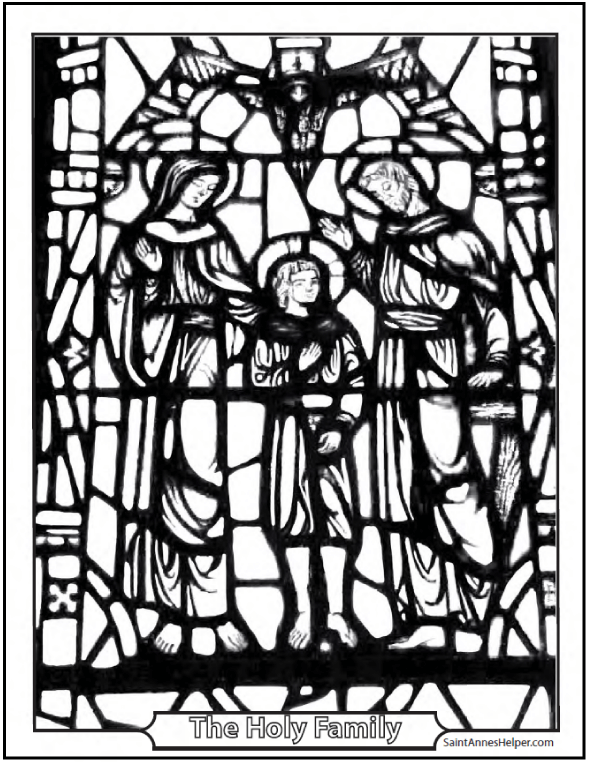 The cross above the window makes a nice stained glass window if your children want to color a night scene. 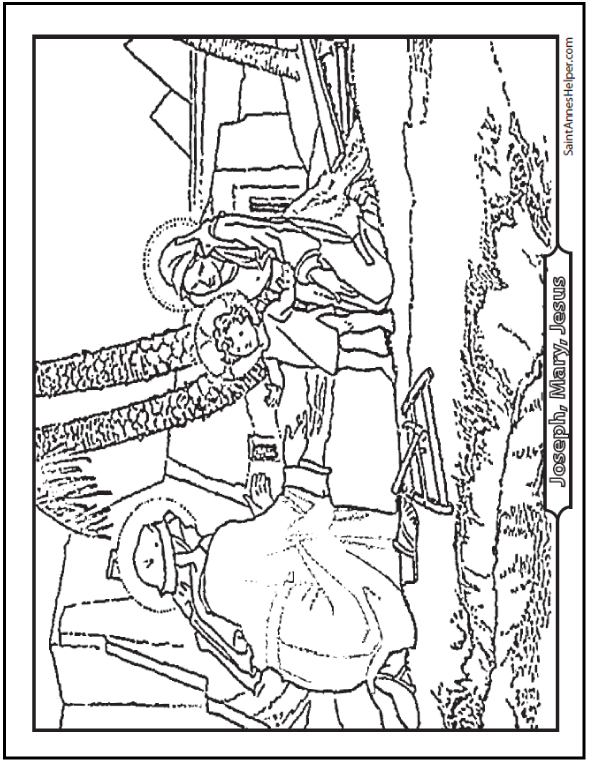 There's nothing cozier than learning the Christmas story and then coloring a picture of Jesus and Mary at Christmas. The Christmas story actually begins when God promised Adam that He would send the Redeemer. 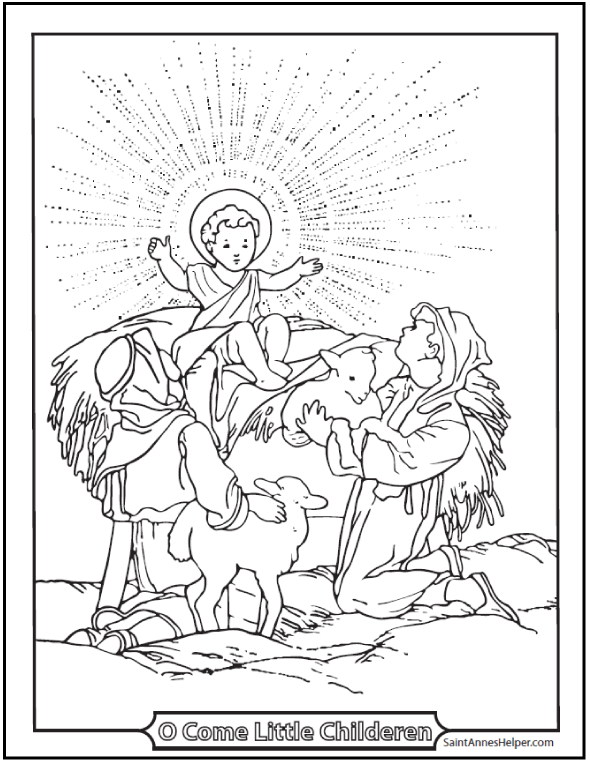 The Annunciation is when He first arrived and the Nativity is when the angels and the shepherds first adored Him so you can go to our Rosary coloring pages and Bible story coloring pages to have more pictures to add to the story. 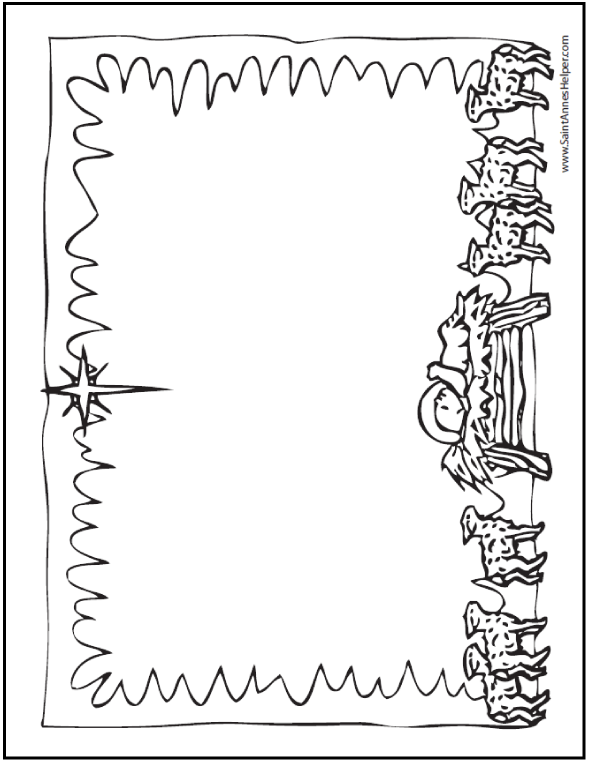 My favorite memories of preparing for Christmas as a child were the times when our parents had set a board across two saw horses so that we could all have space to color in our new coloring books. 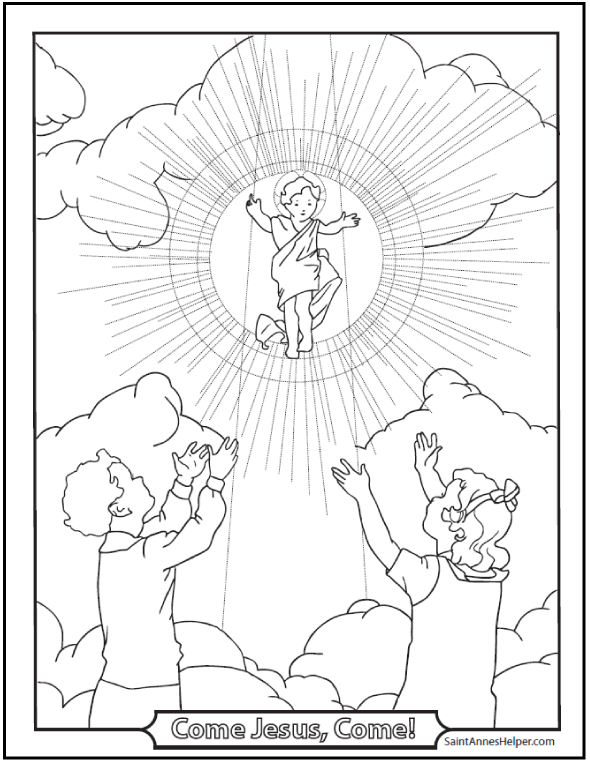 Oh how I wish that we'd had coloring books about Jesus and Mary! 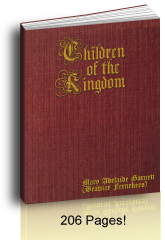 I was taught by wonderful Dominican Sisters for several of my early school years, and my favorite year was during my First Communion year with Sr. Mary Bernice, O. P. She knew how to make the Christmas story come alive. 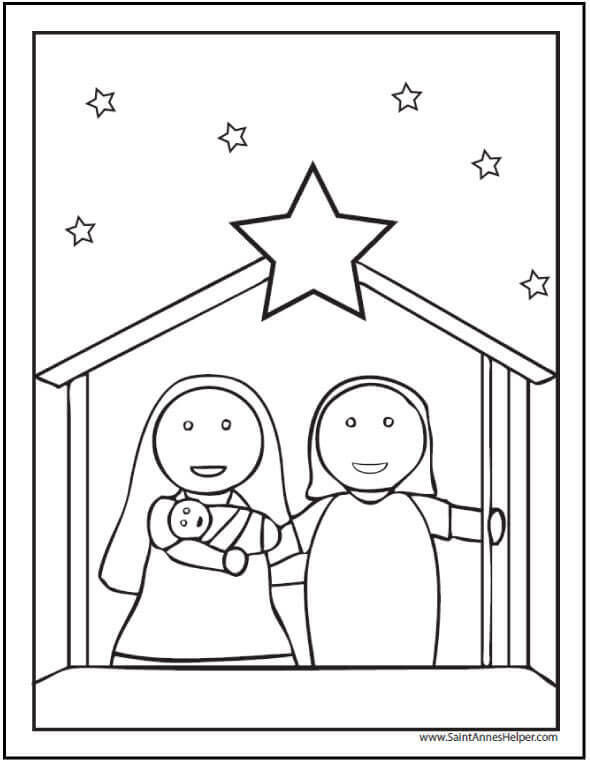 She had had each of us in the class draw our own nativity scenes on construction paper. Then she looked at all of the pictures that we drew and chose her favorite piece from each of our pictures. The next week she asked us each to draw that figure on a giant piece of paper that would hang on the wall for Christmas. That way, the child who had drawn the best star put the star on the big picture, the person who had drawn the best angel drew the angel, and similarly with Jesus, Mary, Joseph, the shepherds, sheep, Magi and all. That was a fun afternoon and it helped me to treasure the story of Christmas. You can help your children feel like they have a part in the story, too. May God rest Sister's good soul and God bless your Christmas! 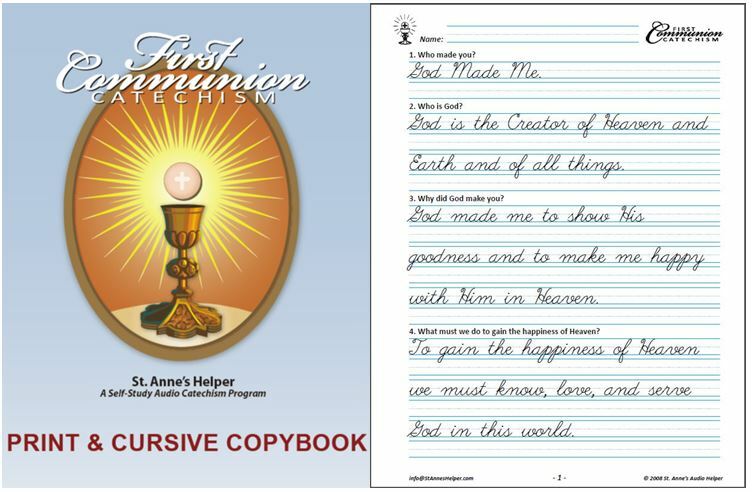 * St. Anne's Helper Catholic Coloring download has a treasure trove of traditional PDF printable coloring sheets. 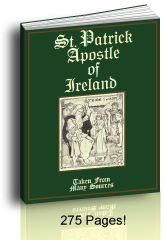 * Over 200 specifically Catholic pictures. * 300+ other fun coloring pictures of animals, seasons, patriotic, Easter and Christmas. * All grouped in files for your convenience and all interactive. 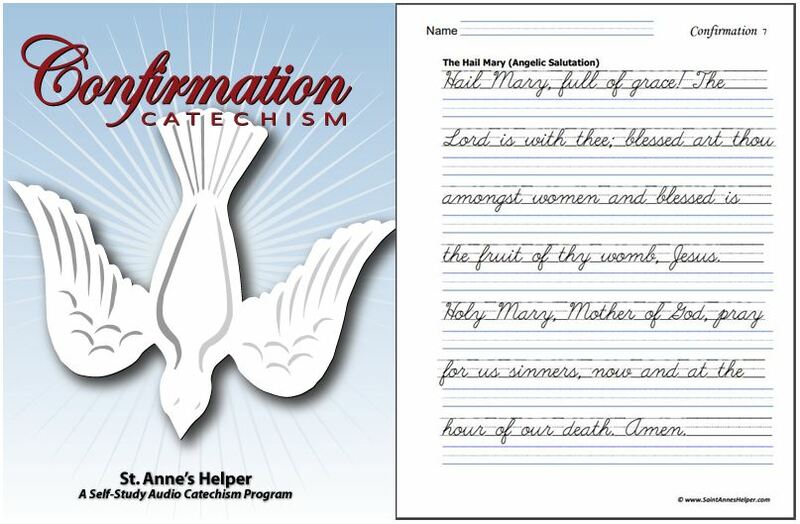 If you use the Baltimore Catechism for Communion or Confirmation, you'll like SaintAnnesHelper Baltimore Catechism Worksheets!